A report from Dodge Data & Analytics, “Green Multifamily and Single-Family Homes 2017,” found that a third of single-family builders say most of their projects are green builds. Almost 60% of single-family builders consider themselves a dedicated green builder, using environmentally friendly building standards on over 90% of their builds. The report, published in September 2017, found that small builders were more likely to identify as green. While green building is currently a niche filled by small builders, analysts at Dodge believe that by 2022, the percentage of large and small firms using green standards on at least 90% of their jobs will be roughly equal. Green building can mean different things to different people, but an important part is energy efficiency. Energy efficiency is baked into Thrive Home Builders’ philosophy, practices and business model. The Denver-based builder has been putting up energy efficient homes since the company was founded as Greentree Homes in 1992, “back before green was cool—and viable, to be very candid,” Thrive CEO Gene Myers said. “We didn’t feel, initially, that green would pay for itself, so we focused on energy efficiency where we could document the savings,” Myers said. Small builders can’t compete head on with large production builders, according to Myers, and green building gives the company a leg up. “We have to be highly differentiated. We have a very highly differentiated brand, and we’re doing stuff that no other builder does,” he told Colorado Builder. Michael Carrier, president of Alpenglow Building and Design in Durango, has also found that energy efficiency and green building help distinguish his firm from the competition while serving homeowners’ needs. “You had an unhappy client, you had a bitter builder who was trying to cut corners, and you had an architect who didn’t produce a service as well as they should have,” he said. Thrive’s brand stands on three legs: healthy, efficient and local. All of Thrive’s builds meet the standards for the Environmental Protection Agency’s Indoor airPLUS program, which aims to minimize indoor air pollutants including biological agents like mold and pollen, and chemical agents like VOCs, formaldehyde and radon. Although Coloradans’ proximity to the Rocky Mountains gives us access to great hiking and skiing, it also puts us at high risk of exposure to radon, a radioactive gas that can lead to cancer. The Colorado Department of Public Health and Environment states that about half of homes statewide have radon levels that are above the EPA’s recommended action level. It’s not just the materials used in building or naturally occurring elements that can pose a risk to indoor air quality. Carpet and particle board used in mass-produced furniture are big offenders, as well as cabinets and paint. Even if a house is completely free of pollutants when the homeowner takes possession, the things they bring into the home can introduce chemicals. Proper ventilation is key to maintaining clean indoor air once builders complete a project and no longer control the home. Myers, a former civil engineer, explained, “When I went to school, the Clean Water Act was passed. The catch phrase was, ‘The solution to pollution is dilution.’ That’s true with air” as well. Thrive uses local beetle kill lumber in its builds. The mountain pine and spruce beetle infestations have impacted over 5 million acres of forest in Colorado since 1996, according to the Colorado State Forest Service. But what Thrive is really known for is energy efficiency, Myers said. The firm has a slew of awards recognizing its successes from the HBA of Metro Denver and Green Builder and Green Home Builder magazines. The firm has won the Department of Energy’s Grand Award, which recognizes housing innovation, every year since 2013. Thrive builds around 200 houses per year, about 20% of which are net-zero production-built houses, Myers said. With its Z.E.N. (Zero Energy Now) line of homes, launched in 2013, Thrive builds homes that can generate as much renewable energy as they consume. 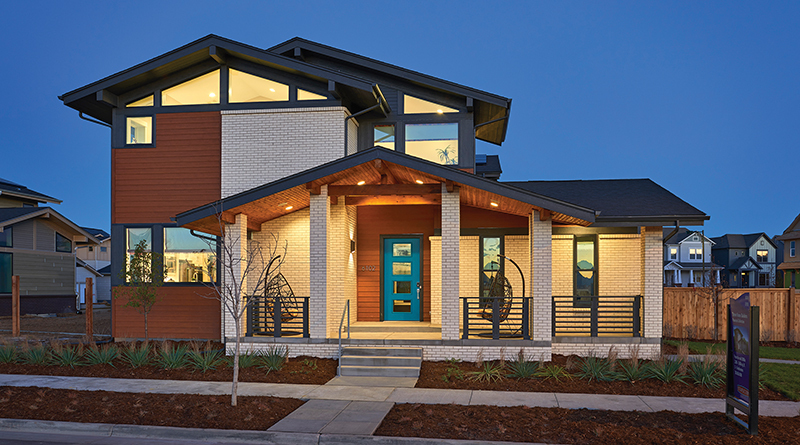 Myers and his team turned to the available resources from Oakridge National Lab, the National Renewable Energy Lab, and Passive House software to develop three two-story single-family zero-energy floorplans. Green building and energy efficiency have always been a passion for Alpenglow’s Carrier. About five years ago, he took on a job for a client who wanted a passive house. “Not really knowing what a passive house was beyond being passively solar-oriented,” Carrier said, he turned to the Passive House Institute US to learn more. “That really opened my eyes,” he said. “The passive house model reduces energy consumption in a building by 70% to 90%.” Attempts to quantify exactly how much passive building standards reduce energy consumption in a building have come up with a wide range of results. A 2015 study out of the U.K. found that passive energy saving methods reduced energy consumption by about 33%. The same year, Passive House Institute published an analysis of energy consumption across several multifamily buildings in Germany that found consumption fell 81% compared to traditional building methods.